NORFOLK, Va. – During its inaugural Helping Hands in the Community day on Oct. 25, more than 80 SpartanNash-MDV associates volunteered a combined 480 hours at eight local nonprofit organizations. 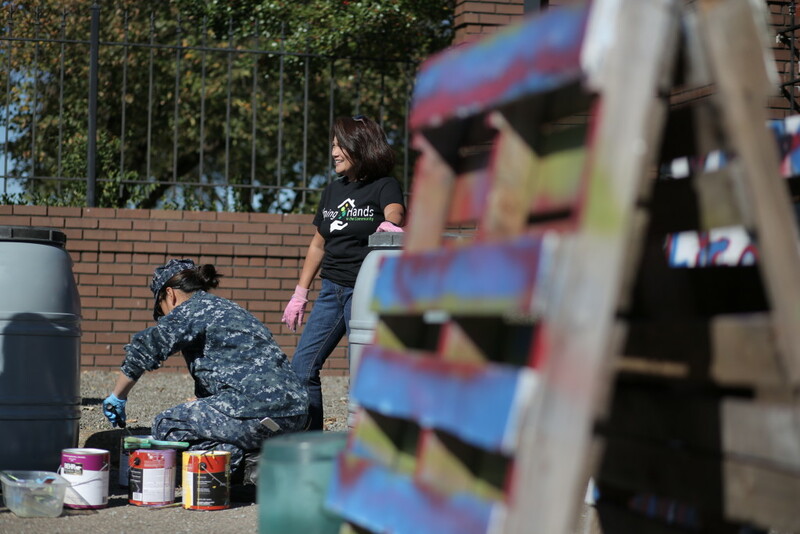 Groups of MDV associates sorted donations at ForKids’ Good Mojo Thrift Store, helped with landscaping and beautification projects at The Mission Continues, painted at the Salvation Army and replanted the garden at Vetshouse Inc., among other tasks during the day of community service. More than half of all MDV associates participated in the Helping Hands in the Community day, completing day-long work projects to benefit community partners including the Barry Robinson Center, Food Bank of Southeastern Virginia, ForKids’ Good Mojo Thrift Shop, Goodwill’s Virginia Beach Retail Store, Operation Blessing, Salvation Army, The Mission Continues and Vetshouse Inc.
SpartanNash – under MDV, its military division based in Norfolk, Va. – is the leading distributor of grocery products to military commissaries in the United States. The company is also the nation’s fifth-largest food distributor, with 159 retail grocery stores in 10 states and 2,100 independent retail customers in 47 states. The inaugural Helping Hands in the Community Day took place when then-Nash Finch employees from the company’s Edina, Minn. location spent a day volunteering together in June 2011. Since then, associates at the Minnesota service center have participated annually, and in 2016, the Helping Hands day was expanded to SpartanNash’s corporate headquarters in Grand Rapids, Mich.
To date, more than 2,100 SpartanNash associates have helped contribute more than 10,000 volunteer hours to more than 50 different community partners during Helping Hands days in Minnesota, Michigan and now Virginia. SpartanNash has placed a heightened commitment to volunteerism in 2016, challenging its associates from across the country to collectively give 15,000 hours of their time to volunteer efforts. Associates are encouraged to find the causes that they are most passionate about and volunteer in their local communities. To date, SpartanNash associates have collectively volunteered more than 11,000 hours. SpartanNash (Nasdaq: SPTN) is a Fortune 400 company and the leading distributor of grocery products to military commissaries in the United States. The Company’s core businesses include distributing food to military commissaries and exchanges and independent and corporate-owned retail stores located in 47 states and the District of Columbia, Europe, Cuba, Puerto Rico, Bahrain and Egypt. SpartanNash currently operates 159 supermarkets, primarily under the banners of Family Fare Supermarkets, Family Fresh Market, D&W Fresh Market and SunMart.